Crazy As Anywhere Else”, the follow-up to 2011’s “The Wörld Is Ours - Vol 1 - Everywhere Further Than Everyplace Else”. Like it’s sibling, Anyplace Crazy… will come packed with more magnificent Motörmaterial from “The Wörld Is Yours” tour, including the triumphant 2011 Wacken headline appearance as well as highlights from the Sonisphere and Rio shows. 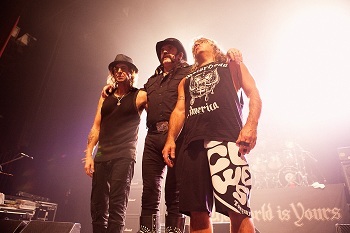 The band will commence with their 2012 European Tour on November 5th in Wolverhampton, UK, ending on December 11th in Kempten, supported by Anthrax.